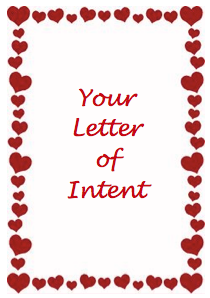 In honor of Valentine's Day, consider completing A Letter of Intent (LOI) as an act of love for your child, as well as their future caretakers and brothers and sisters. The most important asset your child has is YOU. No matter who you have entrusted to care for your child when you are gone—sibling, friend, relative, trustee, guardian, or organization—you can help guide that person by providing them the knowledge that only you, as a parent, possess. The Letter of Intent is not a legally binding document, but it is still perhaps one of the most important documents you can prepare for the future well-being of your child. This is an opportunity to leave a legacy of all that you have accomplished with your child. The Letter of Intent (LOI) has long been utilized as a tool to guide guardians, trustees, siblings and others to care for your dependent child when you, as parents, are unable to do so. In many cases, it contains detailed information that only a parent would know about their child’s history and personal preferences. In every case, it is a document that views the child’s life today and in the future through the eyes of his or her parents or guardians. The actual composition of the LOI requires gathering and recording the people, places and services relating to your child. It also involves sorting out one’s feelings and defining expectations when thinking about the future for your child with special needs. Every child is unique and this document will be unique: it should be flexible, clear and personal. The art of successful planning involves knowing the right questions to ask, not just working with data. Since developing the Five Factors of comprehensive special needs planning, we have organized the content of our LOI based upon these key elements in planning for your child’s future. Many families need a catalyst to encourage them to begin the planning process. An LOI can act as this catalyst by asking thought provoking questions. The LOI and your overall plan needs to be periodically reviewed and revised and it is important to provide your child’s future caregiver with an updated copy. Although completing an LOI is a crucial step in assuring the care and wellbeing of your child should you die, this document may also serve a very important function while you are alive. The LOI may be used as a basis for financial planning to achieve your vision for your child today. Download our fillable Letter of Intent by clicking on the image below. The actual composition of the LOI requires gathering and recording the people, places and services relating to your child. It also involves sorting out one’s feelings and defining expectations when thinking about the future for your child with spe- cial needs. Every child is unique and this document will be unique: it should be flexible, clear and personal. The art of successful planning involves knowing the right questions to ask, not just working with data. Since developing the Five Factors of comprehensive special needs planning, we have organized the content of our LOI based upon these key elements in planning for your child’s future. Many families need a catalyst to en- courage them to begin the planning process. An LOI can act as this catalyst by ask- ing thought provoking questions. The LOI and your overall plan needs to be peri- odically reviewed and revised and it is important to provide your child’s future caregiver with an updated copy. Download a letter of intent by clicking on the image below. The establishment of a special needs trust can provide a false sense of security that you are all set. The money that funds the trust will secure the resources for your loved one to be cared for. A Special Needs Trust (SNT) is a legal document and a very important part of your child's long-term financial plan. Funds in the SNT will not interfere with your child's eligibility for federal benefits like Medicaid and Supplemental Security Income (SSI). Who are the parties involved? The individual who funds the trust is the Donor. The individual who benefits from the trust is the Beneficiary. The individual who oversees the trust is the Trustee. When should families fund the SNT ? In most circumstances the SNT is funded at the death of the parent(s) or primary care giver, rather than during their lifetime. The term used for a trust that is funded at the death of an individual is a Testamentary Trust. Once a trust is funded, the money can only be used to meet the beneficiary’s supplemental needs. A separate tax return must be filed. Taxes on any earnings must be paid by the trust. Income earned in the trust is usually taxed at a higher tax rate than an individual rate. Once a trust is funded, it becomes irrevocable. This prevents you from making any changes to the terms of the trust. Overall, there is no flexibility in your plan. If an individual has more than enough money to meet his/her personal needs and will not jeopardize their personal financial security. Provides the donor with the comfort of knowing that there will be a certain amount of money available for the beneficiary. Parents who have taxable estates and are implementing strategies to reduce their estate tax liability. Grandparents or others are trying to reduce their taxable estate by gifting to your child – the SNT protects the child’s eligibility for government benefits. Money in the trust can provide some protection from creditors. Money directly received by the child either through an inheritance and/or a legal settlement which would otherwise disqualify them for benefits. This would be a “payback” SNT. assess what steps you can realistically take to provide what is necessary in light of your other financial requirements and goals. Review this checklist carefully. It is very important! If you have any questions, please feel free to email Cynthia and John. 1. What is my vision of the legacy which I wish to leave my child (or other family member) with special needs? 2. Have I established proper Wills & Trusts that transform my clear vision into an absolute future reality? 3. Does my Executor/trix or Guardian have a Letter of Intent which outlines my wishes for the future care of this person? 4. Will this Letter of Intent be passed to others who may eventually care for my child, should s/he out-live my second caregiver? 5. Is the Trust endowed with enough money to assure that distributions will not consume their principal throughout the beneficiary's lifetime? 6. Have I insured that caregiving survivors are financially protected from the future expenses in the care of my loved one with special needs? So...are you all set? If you answered "No" to any question, your plan is not complete. We encourage you to seek the answers to all these questions. Think for a moment about the specific instructions or guidelines you give to your child or his or her caregiver when you leave for just an evening out or a weekend away.Imagine if you never came back. Many families need a catalyst to encourage them to begin the planning process. A Letter of Intent simplifies the planning process by initially asking basic biographic information and progresses to more thoughtful and provoking questions. Since developing the Five Factors of comprehensive special needs planning, we have reorganized the content based upon these key elements in planning for your child’s future. By completing a Letter of Intent for your family member, you will begin to develop goals and objectives to assist you in the overall planning process. Ultimately, it will provide the details required for future caregivers to fulfill their expected roles based upon your desires and concerns. No matter who you have entrusted to care for your child when you are gone—sibling, friend, relative, trustee, guardian, or organization—you can help guide that person by providing them the knowledge that only you, as a parent, possess. This is not a legally binding document, but it is still perhaps one of the most important documents you can prepare for the future well-being of your child. This is an opportunity to leave a legacy of all that you have accomplished with your child. You need to periodically review and revise this Letter of Intent, perhaps on your child’s birthday, making certain to provide your child’s future caregiver with an updated copy. As every child is unique, so should this document be unique. Feel free to expand where needed and omit areas that are not applicable. Be flexible, be clear, and feel free to make it as personal as you wish. To download a blank sample Letter of Intent, click on the image below. One of the major obstacles that can prevent families from planning is that they are frequently consumed by daily crises. The thought of planning ahead can simply be overwhelming. Realizing that each family situation is unique, we have identified the Five Factors that must be considered in conjunction with special needs planning. These core planning points are by no means an exhaustive list of planning points. They will provide a baseline of what should be considered in special needs planning for every stage. Think of them as the basics you need to consider regardless of the age of your family member. They should, of course, be reexamined from time to time to be certain the recommendations stay current with your own family's needs. Ask the people whom you want involved with your family member's life whether or not they want to be involved before you just name them in your plan. Help prepare future guardians, caretakers, trustees and successors for their roles. Complete a Letter of Intent -click here to download a sample letter of intent. When grandparents or other friends or relatives offer to help by including your child in their gift or estate plans, say THANK YOU. Encourage them to have their advisors speak with your advisors who specialize in disability planning. Be connected with family support agencies in your area. Help your other children to meet and talk with children similar in age who also have a sibling with disabilities. Seek professional help when you need it. Be patient with yourself, your spouse and your family. Learn as much as you can about your child's diagnosis and abilities. Review your current financial plan -as often as possible. Work with a professional who is knowledgeable in disability planning. Click here to view our checklist for interviewing a financial planner. Protect your family with adequate life insurance, long-term disability insurance, and long-term care insurance coverage for primary caregivers. Identify all employee benefits for which you are eligible. Do not establish a savings or investment account in your child's name. Review your current estate plan -at least every five years. Name a guardian for your child or children in the event of your premature death or disability. Check beneficiary designations on all life insurance, retirement plan accounts and annuities. These include employer benefit plans too. Advocate for your child. Join forces with your state & local advocacy agencies. Know and pursue your child's legal rights and entitlements. Maintain eligibility for your child's government benefits at all times, even if they are not currently receiving them. Apply for Social Security Survivor's benefits promptly when a parent of a child with a disability dies.